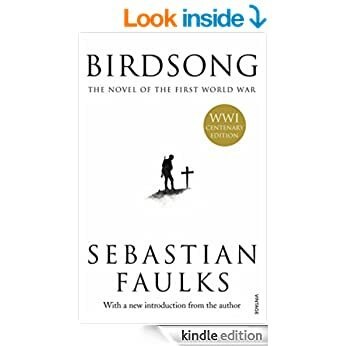 Birdsong by Sebastian Faulks was recommended to me by a friend with the strict instructions to NOT read Human Traces. The first part of this book starts off in pre-war France, and for a moment I thought I was back in the Suite Francaise. Lingering descritions of the hot sultry summer, the slight pressure of a foot resting against and ankle. It all sounded stifling, and I was relieved when the war began. While the writing did start out as too atmosphere-based for my taste, I enjoyed little observations such as that the pattern on a teapot showed “small pink roses set, improbably, on trails of honeysuckle”. Descriptions of the conditions in the trenches were engrossing. The cameraderie of the “pals” who had joined up together, and the sense of loss when their numbers dwindled, was strong without being overly sentimental. Jack Firebrace was particularly worth paying attention to. Reading about optimism before the Somme – “casualties will be ten per cent” – was excruciating (as I’m sure it was designed to be). In an introduction I read that there was very little written about the First World War for many decades after it happened – I suppose the interludes in the 70s were designed to highlight this. I was not entirely convinced that I cared much about Elizabeth or her maried lover or her employers, but the descriptions of her “career woman” lifestyle made interesting reading. As well as the war, it seems that the flu epidemic of 1918 (which I’d now consider to be widely heard-of) had also passed out of common knowledge. This entry was posted in Uncategorized and tagged 2015 book challenge, reading, reviews, wwi by charlieedmunds. Bookmark the permalink.